All artwork is copyrighted by the artist. ETYMOLOGY: The name of the genus Glandularia derives from the Latin glandula, meaning 'little nuts', a reference to how glands feel when palpated. Plants in this genus have glands on the foliage and calyces. The species epithet honors Lewis Newton Goodding (1880-1967), a prominent botanist, collector, and teacher who was one of the first to explore and study plants in southern Arizona. The common name 'verbena' recalls the plant's previous classification, Verbena gooddingii. Goodding's verbena is a short-lived perennial with showy lavender flowers that grow in clusters of up to 1.5" in diameter.It flowers primarily in spring but will flower any time of the year with enough rain or if irrigated. The flat-topped flower cluster provides a convenient landing platform for its butterfly and moth pollinators. The dark green leaves are hairy and are usually divided into three main lobes with coarsely toother margins. Plants can grow into a rounded shrub, about 2' high and 4' wide. 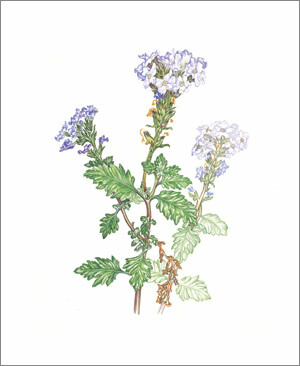 Goodding's verbena is found in canyons and washes and on rocky slopes at elevations below 5,000'.